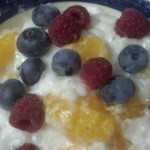 Posted July 19, 2014 by Heather Michet & filed under Food, Recipes. Who feels like cooking when it’s smokin’ hot and the only appetizing activity is to lie in the hammock with a cold beverage? Or you just want to keep playing in the summer fun instead of cook. But you need to eat something. Let your slow cooker do the work while you are at work or play. Call everyone to dinner and feel very smart for ‘cooking’ without having done much prep at all. Here are a couple of easy recipes to get you started: Dilled Chicken & Zucchini and Fruited Tapioca. In a large seal-able plastic bag, mix Parmesan through flour ingredients. Add chicken one half breast at a time and coat each well with dredging mixture. Brown lightly in olive oil in skillet. Place in slow cooker. Top with sliced onion, mushrooms, then zucchini. Mix a bit more cheese with the remaining dredging mixture and sprinkle over the top of layers. Pour chicken broth over all. Cook on low 4-6 hours or until chicken breasts are cooked through. Serve with steamed rice (a brown with wild rice blend is very nice) and greens salad. Combine tapioca and sugar in slow cooker. Blend coconut milk, reserved juice from mandarins and enough water to make 5 cups. Make sure to break up any clumps of coconut milk. Add liquid to slow cooker and stir to combine. Cook on high 3 hours. Turn off slow cooker. Gently stir in mandarins and any combination of fruit you wish. I love the added sweetness of grapes and the crunch of apple. Chill, then serve. Dinner is ready! Take your bows for a lovely meal then return to your hammock, knowing that your slow cooker will continue to take the heat for you this summer – without heating up the house.